...actually, that's a lie. It seems, accurately, like the bulk of a lifetime ago. Amazing what you find when you're raking about looking for old photies. The inside of the programme tells me it was the 20th of January at (of course) the Apollo in Glasgow, and the lineup was Manny Charlton, Dan McCafferty, Pete Agnew, Darrell Sweet and a "newcomer", Zal Cleminson. As a matter of mild historical interest, Ian Dury & The Blockheads were at Number 1 in what used to be known as the Singles chart with "Hit Me With Your Rhythm Stick". That maybe sort of fixes it in time a wee bit better. 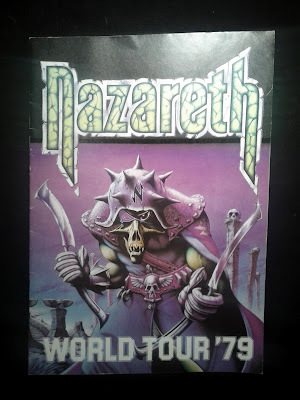 Indeed as the blurb inside the programme says: "Now that the spit, dust and dirt from new wave is settling, Nazareth consider it is time to separate the men from the boys." You'd almost think they somehow suspected that thirty years or so down the line Johnny Rotten would be advertising butter. In spite of the clown stuff and the big boots, ZC must be Scotland's best ever rock guitarist. Or was it Les Harvey ? I haven't honestly heard enough of Les Harvey to say. Some Youtube surfing required. First name that sprung to mind for me was Brian Robertson, if I'm honest. Even for folk that were awfy keen on Thin Lizzy, when you picture the band, he's not the first face you conjure up. He's possibly the first sound, though. Good shout. Classic "forgotten man"
My...eh...3rd cousin, (I think it was) was Nazareth's roadie - until he went to move the van outside the pub after having one too many. Just after that they made it big - I reckon he must have been pretty sick about that!